I collect old sewing books - I mean, REALLY old sewing books. Like 1894 kinda old. This may be an odd hobby (hopefully not to you, Readers) , but I collect old sewing books. The book above this paragraph is one of my very favorites. Until recently, there was no evidence on the internet that other copies of this book even existed. I see that it isn't publicly for sale anywhere, but some libraries do have it in their collections. 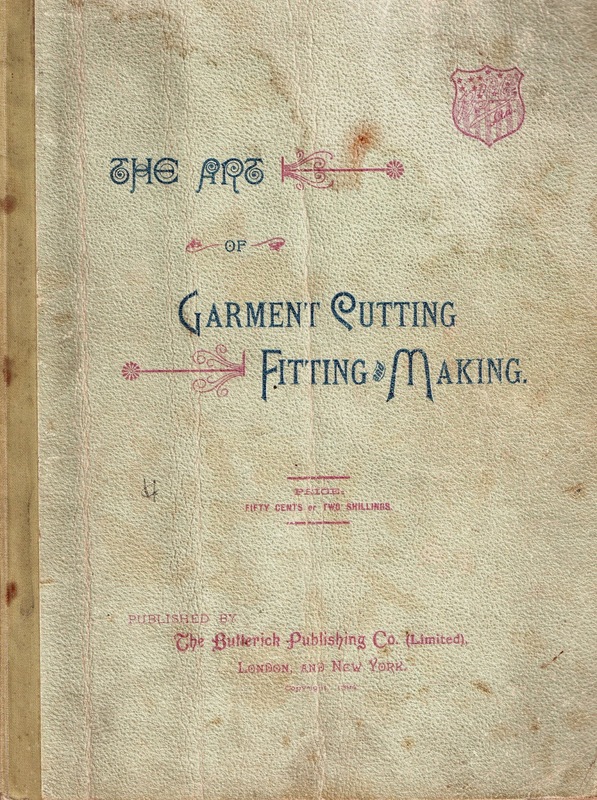 here's why I love books like this one so much; sewing books from the late 1800's have a very special, authoritarian, Martha Stewart-esque tone that just makes me want to devour every single word in them. I have always loved learning terribly difficult methods of doing something before finding the best compromise of an easier, effective method. For example, I had to make an entirely hand-stitched quilt to appreciate the strength and regularity of machine stitches. I now have about 20 such books, and I adore and treasure them in a way that sometimes makes me question my own sanity. Having said that, though, it probably comes as no surprise to you that I love to read. During the time I've been writing posts on this blog, I have read many things that have inspired, educated, and/or entertained me. I am always impressed by the commitment and work a person invests in writing a book, and I really love when I can share that love with others. The Lost Art of Dress Written by a sewing colleague/friend I am truly proud to know, this book gives a beautifully respectful treatment of the social, societal, and cultural implications of dress in recent American history that provides endless fuel for thought. A truly worthwhile read. Custom garment district tour, and an Australian girl's dream achieved! I am often amazed at how far the tentacles of this little blog can stretch. Some months ago, a wonderful Australian woman came to visit New York City, booked a quick custom tour with me, and together, we found the perfect fabric, supplies, and notions to create this beautiful dress for her daughter's school ball (like an American prom) gown. Funny enough, the Australian fell in love with this particular fabric (slightly different from what she chose for her daughter), and bought what became the under-layer for herself, but, upon her return to Australia, her daughter LOVED it, so I went to the garment district to procure a matching chiffon layer for this dreamy silk, and sent it to her in Australia! *Note: The dressmaker commissioned to make this gown is in Australia, and she did a stellar job! If you didn't know it already, this effort proves that a mother's love is boundless! What a lucky girl! The Garment District in NYC is a place that makes me want to look around and sigh... I love the old stories, the connections, and the history. I really have an insatiable love for what goes on here, and the way that the various businesses support, nurture, and inspire one another. The importance of proximity, and how it fuels creativity is so important and well expressed in this video (above). If you appreciate the history and personal connections as much as I do, I invite you to read the posts linked below, about businesses who have honed their craft over time, and really know their stuff! Fabric flowers for embellishments (think Sarah Jessica Parker), accessories (think Chanel) and home decor. A beautiful pleating company, with a history and commitment level that will truly astound you. A pajama manufacturer, whose story and insight on the current state of garment production will get your wheels turning. The idea of spats just thrills me. My permanently out-of-sych fashion preferences lead me to believe that you will embrace this trend in about three years. I'll just say it now, and you can store it for future use, okay? I'll be doing some for myself... Go ahead and hate them if you want... or love them like I do!!! They're just for me, anyway! The history of fashion tells me that everything old comes around again. If that is so, I can't wait for these fashions to come back! 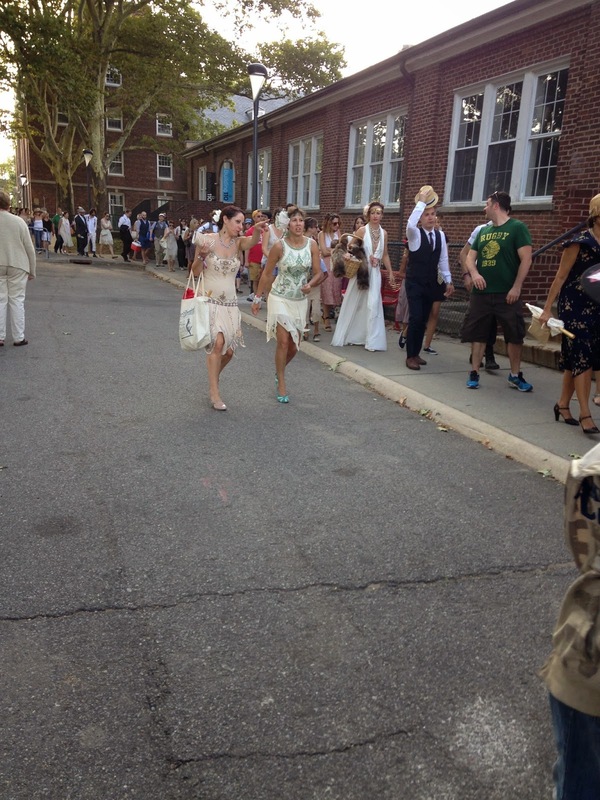 This weekend celebrated the annual Jazz Age Festival at Governors Island, here in New York City. Ending the day - casual or glammed-up, it was fun for all! Not everyone wanted to wear costumes, but there were lots of well-dressed men in the crowd, too! Get georgette fabric pleated by International Pleating for your skirts and dresses! Such a fun place to go, and such a creative inspiration for all involved. A "trend" I've noticed lately, is the popularity and value of trend forecasting services. I would imagine that the people doing the real work of developing a line and keeping it going don't have much time to waste doing their own research, and rely on these proven resources to navigate the fashion jungle. For the early adopters among you, the garment district offers a treasure trove of supplies to make things inspired by the forecasted trends that aren't big YET. Wanna see where fashion is going? Make sure you visit Elliott Berman, and Paron Fabrics specifically (among others), because they have what the designers have actually USED to create what isn't yet in the stores, or high-quality remaining fabric from recent seasons. Not only that, the collaged image displays the trend forecasting agencies will show you as simple snapshots will remind me of specific fabrics I've seen recently in those very stores. You will also note that when you visit the ample selection of beautifully displayed goods in Fabrics and Fabrics, photos from recent fashion images are displayed next to the relevant fabrics, giving inspiration for the fabrics' application for your own creative endeavors. While the big industry events can be overwhelming and offer far more information than the independent designer, custom creative or passionate sewing enthusiast may need or want, there are apps, small bites of free information from trend forecasting agencies (who often offer a more scholarly approach to the who, how and why of trends), along with color trend analysis services to help you along. For example, look at this trend tidbit, and then... check out this Missoni knit from Eliott Berman, or these perfectly on-trend alternatives they also offer from Chanel. Or, make sure you notice the wild textures suggested here, then check out Leather, Suede, Skins for beautifully similar fashion forward ideas. Ideas abound! Just, once you learn, explore, dream and shop, make sure you actually find the time to create and sew! "Well... I know a guy..."
Beware garment industry sourcing sorcery trickery. (Whoops! My apologies, since I thought "sorcery" was my own original clever wordsmithing, but it is actually close to the name of a garment industry sourcing business. Sorry, this comment is not about that business!) So many people offer "sourcing" as a skill, when what they mean is "Oh you need fabric? I know a guy..."
A "hookup" is something a friend or acquaintance can do for you, while a fabric sourcer listens to what YOUR particular needs are. Make sure you know the difference. If you are looking for fabric or supplies at the small business or retail level, you may simply choose to buy a "Speakeasy Map", an ever-evolving map of businesses and services in the garment district, serving both retail and small business customers. As I learn and discover more sources in the district, I will continue to share that information with you! Once you have the link, you can watch it evolve and change, as information is added, taken away, updated, and amended! This week, I attended the DG Expo at the Hotel Pennsylvania, and it was great to see some familiar faces, previously blogged about here: Buttonology, Elliott Berman, Schmalberg and New York Embroidery Studio. A few other interesting new finds I cannot detail here, because I sincerely hope some deal-making was done with vendors in the district who may offer goods here in NYC that you could otherwise only obtain wholesale elsewhere... Fingers crossed that those deals are successfully made! Oddly enough, many others I've seen at this event before were absent this week, and seemed not to even be aware of the event this time around. The floor was extremely quiet when we (my friend/frequent tour partner Cindy was with me), but the benefit and beauty of that was that we were able to talk freely with vendors and see products without waiting. Sadly, though, many of the businesses did not represent the New York Garment District, hailing from other states and/or countries. I also noticed the absense of functioning or up to date websites for many of the companies who attended. This is a very old-fashioned industry, I know, but a healthy web presence is vital these days, don'tcha think? I was particularly excited to learn about MCM Enterprise, where I learned about the sublimation dyeing technique, and TrimLab LLC, where I was intrigued by the interesting way they run their business. Those two businesses may be explored in future posts! Overall, it seems that most interest was directed toward Trendstop, a trend forecasting company, and the business seminars. 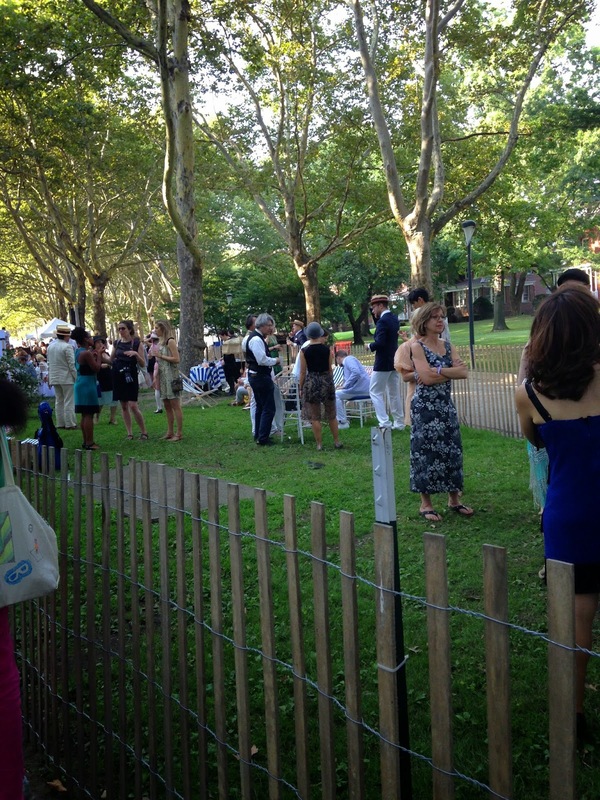 This seemed to be where the youngest people at the event were congregating. Overall, it was fun for me (as always!) and fueled me with a million creative ideas! 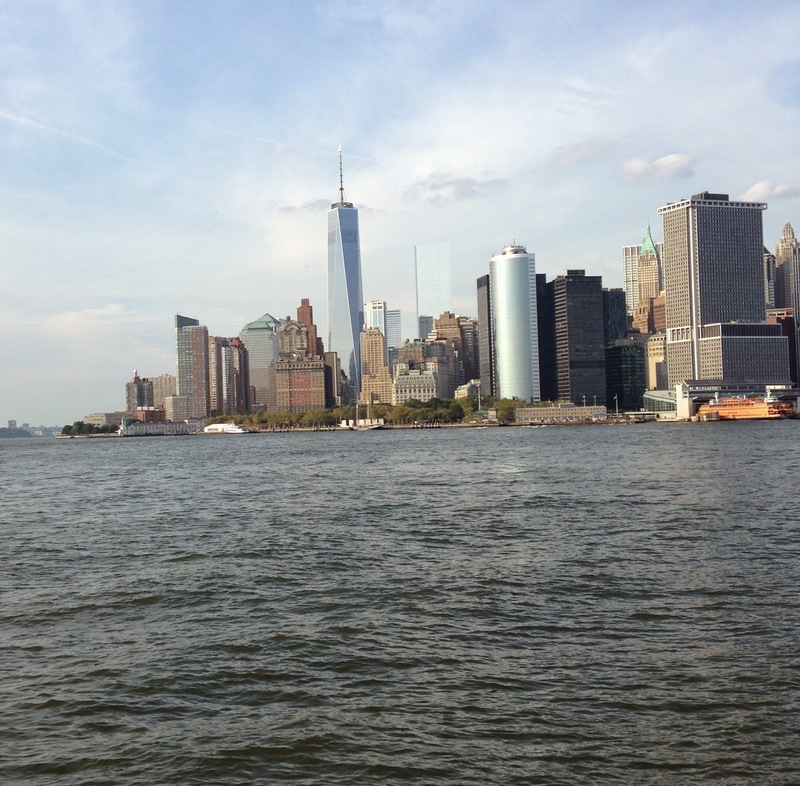 The next New York City DG Expo event will be held in January 2015. Zeno's Paradox... "You can't get there from here"
When I create something, I often feel as if I am creating for a moving target. Whether making something for me personally or for someone else, sometimes it feels as if the goal steadily moves away from me, as I complete a seemingly infinite series of small steps toward completion. Having overcome my creative block... (Hooray! I am even afraid to say it aloud, for fear it will return! ), I have been steadily been working toward the completion of three major garments promised to others, with a pile of personal projects that truly excite me on the horizon immediately behind them. As I create, the wearer (whether me or someone else) gains or loses weight, gains or loses confidence about wearing it, the timeframe, personal design choices, or ruminates on the color of the fabric or trims, while the weather changes, and the general fashion mosaic continues to change around us... And I pursue new additional things, have new challenges, gain and lose mojo, and so on. This is always true, but I have discovered that the quick, decisive, SCHEDULED completion of a project is the only answer to this problem. For me, that is the eternal challenge. I have periods of outrageously productive creation (usually in the Fall), and what I find is that most of the things I eventually create lived in my head for a long time before they finally became real. About 2500 years ago, Zeno, an ancient Greek philosopher, offered a series of interesting mind puzzles, known as paradoxes. I am particularly intrigued by Zeno's paradox of the tortoise and Achilles. Achilles concedes the race, deciding that the tortoise was correct. But is he? Of course not. Life has taught us differently. If I can work quickly enough, I will eventually catch up - unless I stop, right? The paradox breaks the race down into infinitely small steps - so many, in fact, that the series of tiny steps in infinite, and there is no FINAL step. So, the thought this leads me to is this: Is there actually a "there"? If so, where is it? Does it need redefining? Let's say you are making a pair of pants, a shirt, building a design career, launching a product... Do you have an actual goal in mind? If we make our goal to simply overtake the tortoise, with no actual finish line, are we missing the point? Should we redefine the goal? Is there a level of completion that is actually "complete"? I looked for evidence online that creative people were finding Zeno's paradox relevant to their own creative lives, and there are others who have written quite beautifully on this topic. Among knitters, it can be called the "second sock" syndrome. Among painters, the infinite combination of colors, brush strokes, ways to convey the work are endless, and that is what confounds us. Isn't it? I made a particular convertible wedding dress (one of many I have converted in this way) for one particular client some tears ago. 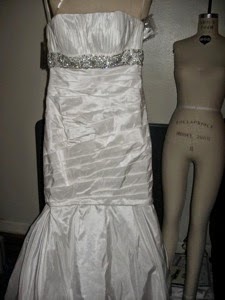 This idea turns one dress into two, for the bride who wants to "let loose" at the reception without changing dresses. She was a creative - an actress and dancer, with whom I had an excellent rapport. 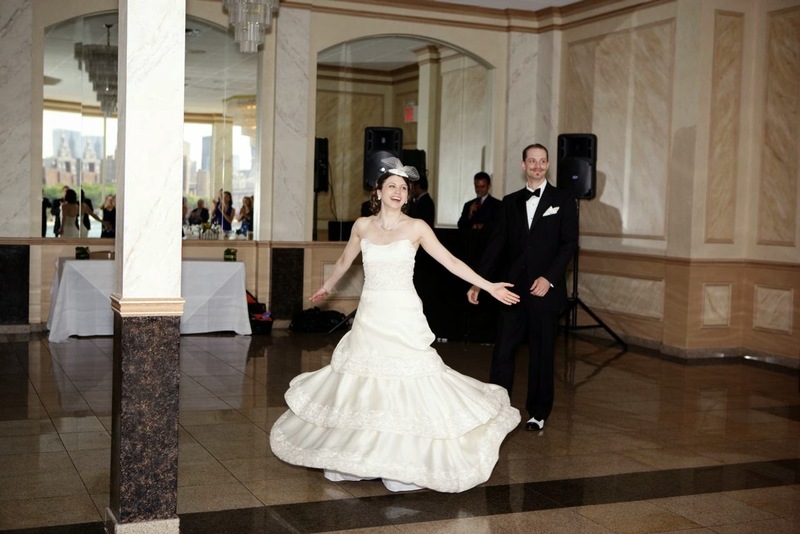 During our process, however, we made what seemed like an impossibly long series of tiny incremental changes to the separating zipper I'd installed, the tulle and lining of the short version of her dress... until the deadline (wedding date) loomed ominously. Caught in a spiral of infinite creativity, we were eventually forced to stop, due to the timeframe. Clearly, we all (creatives) need a bit of that in our lives. Strangely enough, that is the beauty of business. Business puts a definite period on things. It makes us stop at some point to meet a goal. If we don't, the business will meet its own demise. Plenty of them do. Happily, business deadlines serve as great practice for actually getting things done. 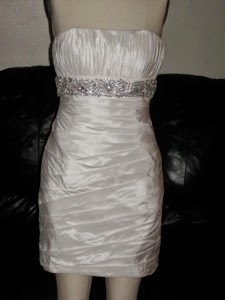 The next store-bought dress I converted, was significantly easier. One fitting, and I was DONE. As an aside, this is an alteration/redesign I love to do, because it is really such a "costuming" decision, it fuels conversation, and it amazes the guests! Business, has for me, been a significant boost to my productivity, because it puts a period at the end of every garment... whether I like it or not! Hope this is helpful! Please comment if it is! I so admire people who spend a lifetime perfecting a unique craft. This video shows a particularly beautiful profession through lovely cinematography. The more you create, the more important your tools become. Invest in the best tools you can afford. You won't be sorry.